My mother’s faith in God gave us hope and allowed her to bring ideas into reality by following her heart and the creative thoughts on new ways to provide for us. The fact that we were still alive months after my father was assassinated and that my mother was earning enough money to sustain us was enough for me to start believing in God. It did not matter if God was real or not. Our flight from Benin to New York City carried 250 refugees. We arrived at JFK Airport on February 17, 2000. Things were happening very fast. In two hours we would board a small airplane headed to Manchester, New Hampshire. All we knew about New Hampshire was that it was close to Boston. It felt surreal to actually be in America. There were five of us—my three brothers, my mother and myself. 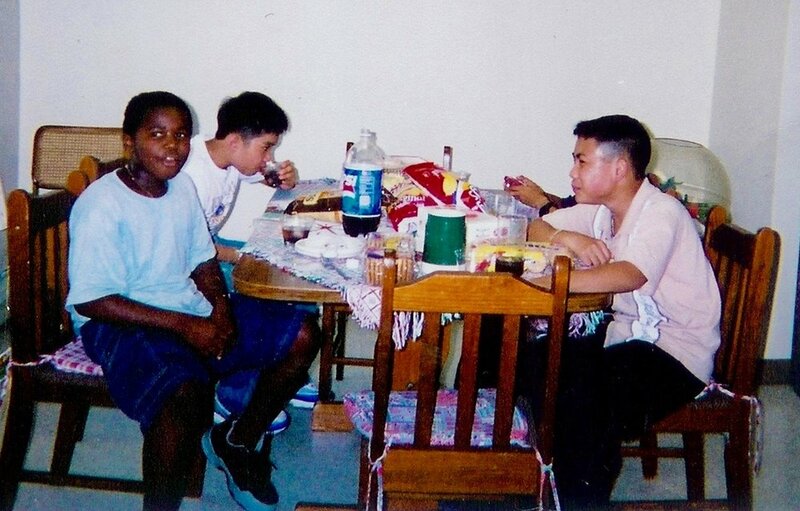 At nine, I was now the patriarch of the family. We had spent the last two years living as refugees in the small West African country of Benin. Of our fellow passengers, we were the only ones going to New Hampshire. The airplane to New Hampshire had just 30 passengers. For the entire flight my mother’s arm was draped across the shoulders of my two youngest brothers, Destin, age two, and Gedeon, age three. I set next to Vinny, who was seven. I kept thinking about the vast cement and asphalt city of New York as we flew over a wilderness of trees covered with snow. I wondered if we would be the only African family going to this place. A man’s voice over the intercom filled the cabin. He spoke in English and, since our grasp of the language was minimal, we did not know what he was saying. As the airplane descended, we saw roads and small houses. “Is this it?” I asked my mother. She did not know. Snow covered everything and there were no tall buildings. The airplane landed and we were the last ones to disembark. I was entrusted with our blue and white IOM (International Organization for Migration) bag. Given to us by the UN at the refugee camp, the bag contained all of our refugee documentations and destination information. Without it we would be lost—literally and figuratively. We were told to keep the bag visible throughout our travels. There was no passenger bridge, so we had to walk outside to get to the terminal. It was bone-chilling cold. Inside we were welcomed by Moraud, a specialist from Lutheran Services (now Ascentria Care—based in Concord NH). Originally from Morocco, Moraud spoke French. We felt more at ease thanks to his warm greeting and ability to communicate with us. He told us we would stay in temporary housing until our place was ready the following day. Our apartment in Manchester had three bedrooms, a kitchen, and a living room. It was furnished with second-hand furniture in good condition. Our cabinets and fridge had food purchased by Moraud with funds from Lutheran Services. A few trash bags contained second-hand clothes. My brothers and I sorted through the clothes and picked the ones we liked. We were excited to settle down in our apartment. So was my mother. She had no possessions to give us, but she had something better. “I have nothing to give you but guidance,” she said. And with that guidance, she assured us, she would help us find whatever opportunities this country offered us. Lutheran Services showed us around during our first few days in New Hampshire. They took us to hospital appointments, grocery shopping, immigration appointments and enrolled us in social welfare programs. My mother was enrolled in ESOL classes. We found a local Catholic church, Saint Anthony’s, a few streets from our home. We met some awesome people at Saint Anthony’s. By our second week in Manchester, many people had welcomed us. The first person we met was Sister Irene. She visited us with a box of food and trash bags of clothes. She became one of our closest friends and introduced us to many people. She spoke French and helped my family very much. Every day we had people knocking on our door. Most of our new friends were French Canadian families who had lived in Manchester for generations. Among them were the Bessonettes, who basically adopted my family. We called the two grandparents Papa and Mama Bessonette. They had a vast immediate family in Manchester and the surrounding towns. Between the Bessonettes and Sister Irene, we felt welcomed and loved by the people of Manchester. Furthermore, we were fortunate to meet some other African families who resettled in New Hampshire. They came from Burundi, Nigeria, Sudan and Somalia. By the third week, my brother Vinny and I enrolled at a local elementary school which was one mile from my house. My two younger brothers started daycare. My mother continued going to the ESOL classes. But the excitement of moving to America began to dwindle the longer we settled in. And we began to experience the challenge of starting from scratch in a new country—with no family or money, unable to speak the native language, and not having a driver’s license or a car. While we lived in a great location, close to a Walgreens Pharmacy and Vista Foods grocery store, everything else was à la carte. For transportation we relied on taxis, friends, and sometimes the Lutheran Services. Public transportation in Manchester was not the best. When my mother realized the money she was getting from the social services was not enough to support us, she stopped going to the ESOL classes and, with the help of Lutheran Services, found a job at a local factory. She was able to coordinate rides with some of her co-workers and in return paid for the transportation. Our first month in New Hampshire was not easy, but we were able to acclimate and find help when we needed it from a circle of about 50 people. Sister Irene was the angel from heaven who oversaw much of this help. She gave my mother strength and advocated for us in many areas when Lutheran Services support tapered off. During our first summer, Sister Irene coordinate with volunteers to drive my brothers and me around while my mother was at work. One family even took Vinny and me to a summer program. Another family took my two brothers to daycare. We were never alone. Sister Irene was the impetus behind our first-year successes and breakthroughs. She spent a lot of her time getting to know us and customized her support based on what worked for us. By February of 2001, a year later after arriving in NH, we had a community of friends we called family. We no longer had Lutheran Services supporting us. Most resettlement agencies support new refugees for three to six months. Sister Irene taught us how to be resourceful. We became part of the Bessonette family. They were strong and giving people. On most holidays and birthdays they brought us to their home and blessed us with gifts, love, and encouragement. 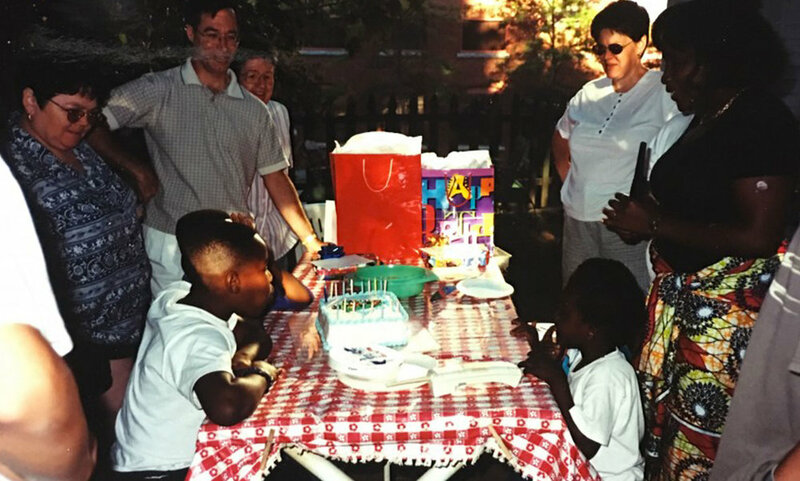 On her 27th birthday, my mother was surprised with a celebration. Everyone brought her gifts, and she had a large cake. My mother was very happy that day. 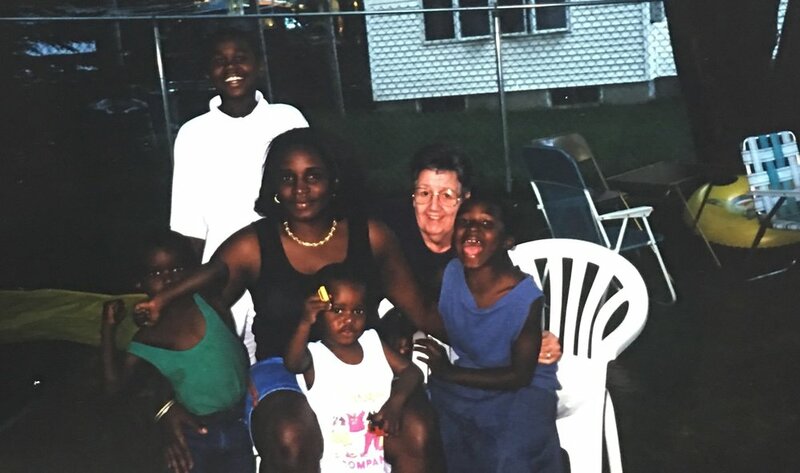 She had gone through a lot of trauma helping my family get out of the Congo, and was particularly grateful to have the Bessonette women for moral and mental support. Mama Bessonette always had her back. We were all overwhelmed by the Bessonettes’ kindness. It took my mother four months to get her license after we moved to Manchester. This, along with having a car, was a major milestone for my family. It built our confidence and gave us encouragement. Now we had our own vehicle to go places. It meant more freedom and more access to the things we wanted to do. And it would not have been possible without the Bessonette family’s encouragement and support. They dedicated their time to teach my mom how to parallel park and risked their own credit by co-signing her loan. 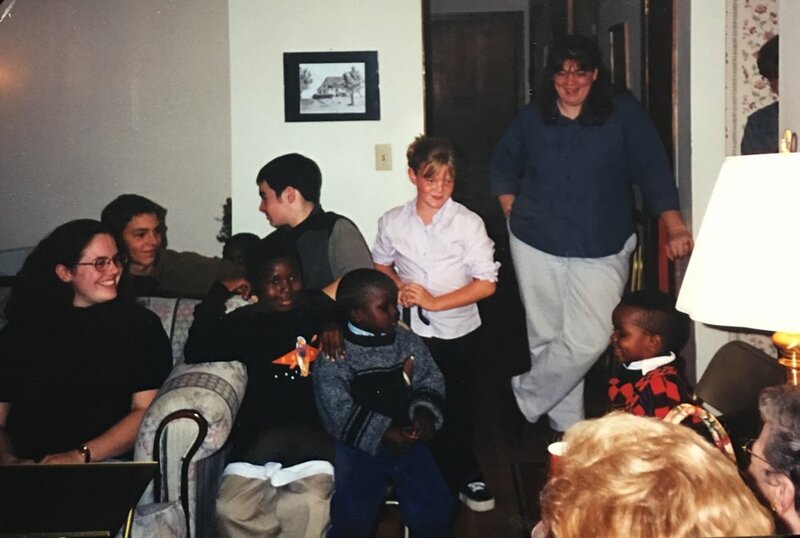 At the end of 2000, we spent Christmas at the Bessonettes. Their immediate family totaled 35. The Bessonette family showed us unconditional love that helped us heal the many wounds we brought with us to New Hampshire. As our circle grew, we continued to make progress adjusting to New Hampshire life. We were also becoming more self-sufficient. The ability of my brothers and me to speak English improved tremendously. My first two years of school were spent in ESOL classrooms. Many of my friends were from Sudan, the Dominican Republic, Bosnia, Mexico, Vietnam and Uruguay. We were all trying to learn English and adapt to America. Extracurricular activities like sports, music, and performance allowed us to integrate with native students. 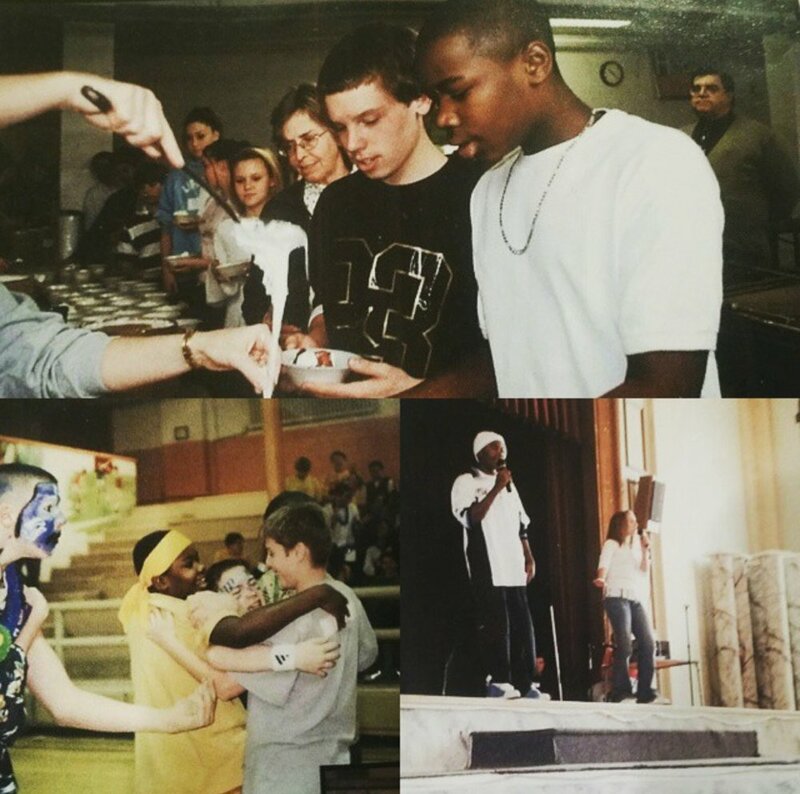 In fall 2001, I started sixth grade at McLaughlin Middle School. I was in an ESOL class for most of the day but was able to take other classes with native students. In sixth grade, I joined the orchestra. I enjoyed learning music and how to play the viola. Under the guidance of my teachers, we started a bongos percussion ensemble and performed at different school events with the orchestra. It was an awesome experience. I was able to utilize my drum skills from growing up in the Congo. I am grateful to my orchestra teachers for the opportunities they gave me. It was the beginning of my involvement in extracurricular activities. When Sister Irene saw how I excelled in certain areas in my learning, she thought I should attend a private school. She worked very hard to advocate for me to attend Saint Joseph, a private middle school with students from all over New Hampshire. I was accepted and began in seventh grade. My mother thought Saint Joseph was a better place for me to study, but I did not want to go. At Saint Joseph, we had to wear uniforms and tuck in our shirts. And no jeans! There were no ESOL classes either and diversity was very low. 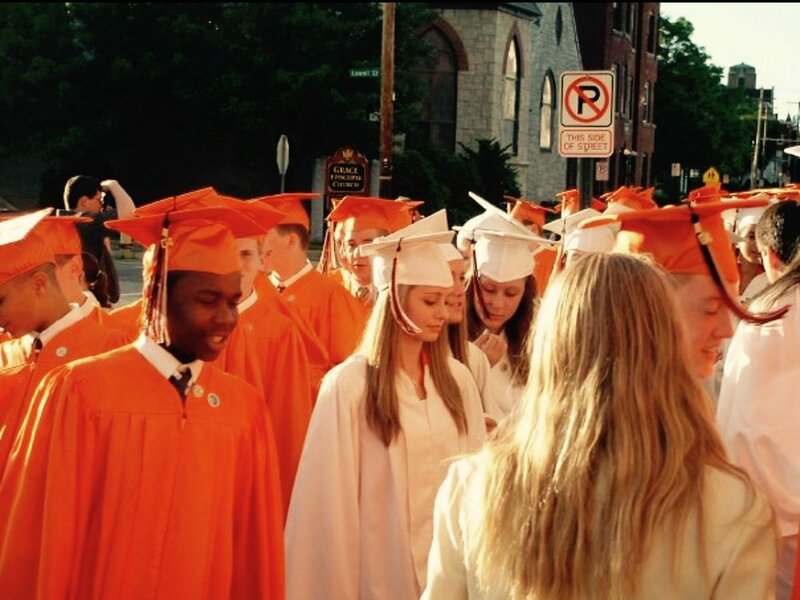 There was only one other black student and one biracial kid—half black, half white. On the first day of school, I fought with my mother because I did not want to tuck my shirt in. She dropped me off, but wouldn’t drive away until I tucked in my shirt. But I misjudged Saint Joseph. It ended up being one of the best environments for me to learn and engage. I discovered a lot about myself in 7th and 8th grade. The school ignited my inner creativity. I felt very welcomed by the teachers and my classmates. I joined the soccer team and loved it. The administration encouraged me to pursue dance and music. I formed a dance team, and we performed at school events. I was not the best student academically, but I worked very hard. I spent twice the time doing certain assignments as my classmates. On the plus side, my English continued to improve. Even better, I made lifelong friends. My friends’ parents were very welcoming, too. They would always give me a ride home. Sometimes they even covered extracurricular costs my mother could not afford. Even though I had a great experience at Saint Joseph, middle school was a very dark period for me. I dealt with depression, anger, and suicidal thoughts. The more comfortable I was adjusting to America, the more my past experiences with the civil war in the Congo haunted and tortured me. I would share stories with my classmates about the atrocities I experienced. Some were open to learning, but others didn’t care or understand the magnitude of my family’s ordeal. Through prayers and focusing on things that built my confidence and kept me engaged, I was able to have some breakthroughs. Church always played an important role in my family’s successful acculturation. We ended up changing to a non-denominational Pentecostal church called Believers Christian Outreach Church. This church was more aligned with what we had known. It was critical to my emotional development during my resettlement. Believers treated us as family. In fact, my Pastor, John Fortin, and the elders—Nick Dager, Harry Shepler, Norm Hebert, and Ron Cote—treated me like a son. They mentored me. When I needed help, they stepped in and cared for me unconditionally. They even helped me develop a sense of responsibility by giving me work at their businesses and yard work. The extra money freed my mother from worrying about her inability to buy me the things she thought an American boy should have. The pastor and church elders helped me to see possibilities I could not see on my own. I also met some awesome women—JoAnn Trombly, Michelle Dager, Barbara Shepler, Darla Freeborn, Anna Hebert, and Celeste Fortin—who were also very nurturing. It was like having a group of mothers who had my back. JoAnn Trombly was my youth group leader. She worked with my mother to help her see the value of my involvement with different activities. I remember calling JoAnn and crying to her about how depressed I was and how I could not escape my bad memories. She always had great words of encouragement and helped me find activities that cleared my mind of self-destructive thoughts. At the end of middle school, I overcame many of my personal challenges. I came out a very different person than when I started. My church and Saint Joseph families were critical in building my confidence, encouraging my creativity, and making me feel like I belonged. I developed a strong self-confidence and drive. My community in Manchester gave me a seat at the table to be me. I felt grounded and knew I would have support in whatever direction I chose to go. And of course having the support of my own family during those first four years of living in Manchester provided me with a strong foundation for what I hoped to accomplish. In so many ways I was lucky to come to America when I did. Today refugees and immigrants are marginalized. They feel—and are—unwelcome too often. People come to America because they want the opportunity for a better life. It’s not an easy process. Refugees must endure a long and tough vetting process. Case review takes a minimum of 32 months to resettle once selected. Refugees have less than a 5 percent chance to resettle in western countries. Diseases and sometimes blood types prevent people from being selected. For those who are chosen, it’s a dream come true. The average time spent in a refugee camp is ten years. By the time refugees move to their final destination, many are starting from scratch with nothing except the dream of a better life. It is our duty as American citizens to provide a welcoming community. This will not only increase the success trajectory of refugees. It will encourage refugees to contribute positively to your community. I leave you with these thoughts: Your ancestors came to this country to find a better life. Along the way, they relied on help from their communities to succeed. That success trickled down to the privilege and access you have today. How can you get involved and contribute to a positive trajectory of refugees’ success in your community, town, city and state? Find out today.